BlogArizona.com - An Arizona Real Estate Blog: Vote Yes on Prop 300 - Bring the Waveyard to Mesa! Vote Yes on Prop 300 - Bring the Waveyard to Mesa! Today is Special Election day around the Valley - various cities including Mesa, Gilbert and Queen Creek are voting on different Propositions. I just finished filling in my absentee ballot for Mesa's Proposition 300, which is the only question on Mesa's ballot. I didn't get it done in time to mail it, so I have to drop it off at the polling place before 7:00PM tonight. Mesa's Proposition 300 is about bringing the Waveyard to Mesa. Most Mesa residents have probably seen the commercials or received mailings regarding the Waveyard by now. If approved, the Waveyard will be a world class resort which emphasizes water sports. It will be perfectly located in northwest Mesa, close to the airport, Phoenix and ASU. Voters are being asked to approve the sale of Riverview golf course and four nearby softball fields, to the Waveyard developers. The Waveyard developers would pay $30 million for the land - $10 million up front in cash and the remaining $20 million will be paid over 24 years, with interest, in the form of tax receipts from the property. Additionally, Mesa would reimburse the Waveyard developers for up to $1.5 million in public infrastructure costs. Earlier this year, I was invited to an informational event where Mesa city officials and the people behind Waveyard briefed the real estate community on what Waveyard is about. It's not just another water park at all. It's going to have a whitewater rafting river, a king size wave pool, a deep scuba lagoon and other sports venues. The wave pool is not what you think of when you think of Big Surf or other Valley water parks. This is a serious wave pool, with huge surf-able waves. Waveyard is expected to generate $5 million per year in revenue for the City of Mesa. It will have areas you can go without paying admission, and will have an abundance of retail stores, a four-star hotel with an indoor water park, office space, fine dining and even residential properties. But it's not just for young people - it will have something for all ages. And it's not just for Arizona residents, it's expected to attract one to two million visitors per year. Mesa has approved large projects like this in the past and the developers couldn't raise the money to complete the project. Don't punish the Waveyard developers for what some other developer did in the past. I assure you, the City of Mesa thoroughly checked out these developers and their finances. There are also various financial protections built into the deal for the City of Mesa. Mesa shouldn't give away money in tax incentives to big developers. The developers are doing Mesa a favor, not the other way around. Mesa needs something to generate revenue and Mesa residents should feel fortunate for this opportunity. Otherwise, the taxpayers will be asked to generate the millions in revenue Waveyard doesn't generate. Also, Mesa did not take this deal lightly, and has protected itself. Only 0.75% of Mesa's 1.75% sales tax will be used to repay the $20 million in principal and interest, so Waveyard will be generating revenue for Mesa as it repays the money. And if the 0.75% is not enough to make the annual payment, the developers will have to make up the difference. As I mentioned, Waveyard is expected to generate $5 million per year for Mesa city services such as police and fire. The Waveyard will also create thousands of construction jobs, as well as thousands of permanent jobs. What about the golf course and softball fields that will be lost? The softball fields will not be lost, they will just be relocated. The golf course, on the other hand...well, does anybody really think there's a shortage of golf courses in the Valley? Come on, now! It will cause too much traffic congestion. You could say that about any development, but this project is being planned with traffic congestion in mind. This area is really perfectly located for such an attraction. It has great access to multiple freeways, and is already a heavily traveled area. The developers of Waveyard are way ahead of the nay-sayers, and have already put a great deal of planning into the traffic aspect of this project. It will use too much water. This is simply not true. The Waveyard will use water from a currently untapped, on-site well. Although it will take up much more space and generate much more revenue for the City of Mesa than the existing Riverview Golf Course, the Waveyard will actually use LESS water. It will also use much less water than Tempe Town Lake. 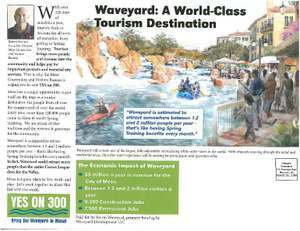 As a city in financial crisis, Mesa NEEDS the Waveyard. I personally can't see why any Mesa resident would vote no on Proposition 300. 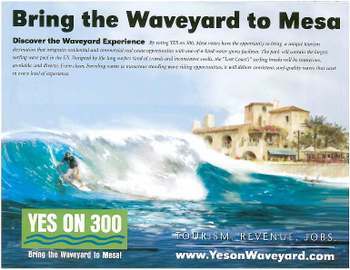 VOTE YES ON PROPOSITION 300 and BRING THE WAVEYARD TO MESA! 11/7/06 UPDATE: Looks like Mesa has approved the Waveyard!! All three of Gilbert's propositions were also passed by Gilbert residents. Here are the election results. Congrats to Mesa on approving Waveyard. If you live in the area, your property values will go up as a result of this development.